This is the beginning of a series of profiles of horses and riders on track for competing for 5 spots on the US Team for the World Endurance Championship, part of the 2010 Alltech FEI World Equestrian Games, to be held on September 26th, in Lexington, Kentucky. Some people like to travel when they retire. Some take up hobbies - golf, classic cars, painting. Chris Martin became obsessed with something else, something with legs and a slim figure. "Imagine being old like me and having some young horse consuming your every thought.. kinda like 'crazy'..." Who else would have the name of his horse tattooed on his arm? Chris' wife Nancy isn't seen sporting a tattoo of Monk anywhere, but she chuckles at Chris' obsession, and she can be seen at Monk's rides, helping to crew, and enjoying herself as much as Chris. Four years ago, Monk was an unbroke 4-year-old Arabian gelding of CMK breeding in Chris's pasture, a 'Plan B' for a riding horse. He'd had him since he was a yearling. But when the Shagya stallion Chris had bought to to be his 2010 WEG horse bucked him off, Chris put that horse in his pen and never rode him again ("Life is too short"). Monk became Plan A. At first Monk was stand-offish, but once Chris got a halter on him, Monk started following him around like a puppy dog. When Chris decided to break him, it took all of about one day. "I just led him to the trailer and tied him up and put the saddle on him, and ponied him around a bit. 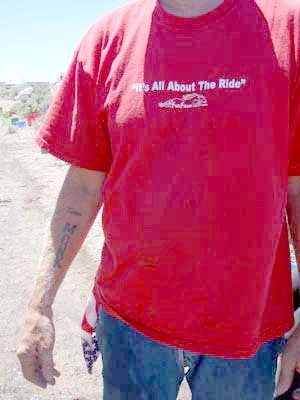 Next day I had a friend lead us around with me on his back, and after that there really wasn't much to it." Chris rode and built a foundation under his horse for two years, forging a nice bond with him; and though early on Monk loved to run fast when Chris let him, it was far too early to tell what kind of horse he might be. Monk started his endurance career in his 6-year-old year. Carolyn Meier rode him on his first 50; Chris rode him on his next three. Monk wasn't anything special then - though he showed he had some speed, he didn't eat or drink well and his mind wasn't particularly on the trail. 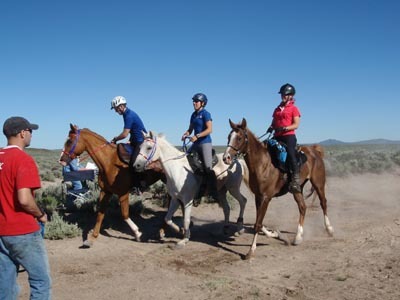 But on his 5th ride, the Comstock ride outside of Reno, Nevada, in October, Chris got an inkling of exactly what kind of horse Monk might become. Chris and Monk rode much of the ride with Michelle Roush and her FEI horse PR Tallymark, finishing third and running a sub-5 hour 50 miles, and looking very good afterwards. 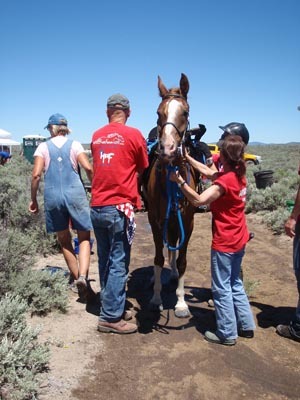 "It all came together at the Comstock ride. It was a turning point for him. He drank well, ate like a pig; at his post-ride check he had all A's and a 44 CRI at the finish. We finished only 14 minutes behind the FEI horse that was going to the Malaysia WEC." Monk finished 4 more 50's in 2008, and Lindsay Graham was aboard for the last two. Carolyn was unable to commit to a possible FEI campaign, and Lindsay was recommended. "I only rode him on a brief 1-hour training ride before our first ride," Lindsay recalled, "just to get to know him. We just trotted, probably didn't even canter - I could see he was safe, which was a change from what I was used to!" "Used to" was her mom Susan's endurance horse Phoenix Affair. Lindsay had been riding horses since her mom first sat her on a horse before she was a year old. She got a pony for her 5th birthday; when she turned 13 she got an Off-The-Track Thoroughbred and did Hunter-Jumper shows with him until 2001. She rode for the UC Davis Equestrian Team (where she attended vet school); and then one day Lindsay's mom talked her into riding her endurance horse Phoenix Affair when she hurt her back, in 2004. "I got suckered into it," Lindsay says wryly. "I agreed to do it for just one year." That one year turned into 3 years on Phoenix, and included 2 Tevis completions. In 2006 when they finished 7th, Phoenix was the oldest horse, at 19 years old, ever to top 10 Tevis. 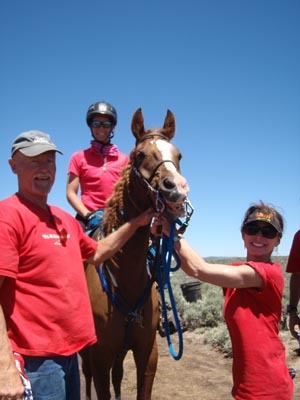 Together, in Lindsay's first international competition, they also completed the 100-mile North American Endurance Championship in Maryland in 2004; Phoenix was the oldest horse (18) and Lindsay was the youngest rider (24). 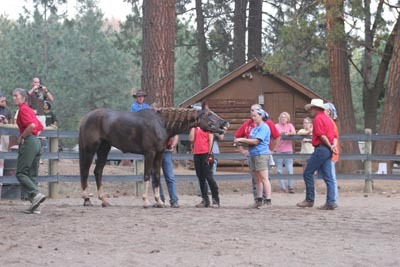 Phoenix was a handful of a horse to ride - "a big 16+ hand horse with ATTITUDE, and great confidence. He was like a freight train. I always felt like a had a lear jet beneath me ready to take off, I could feel his power." Monk, on the other hand, didn't seem to be anything particularly remarkable in those first two rides, not compared to Phoenix. "I just noticed he wasn't a lear jet, like Phoenix Affair. Monk just went out and did what I asked him to do, stayed on pace, did his job." 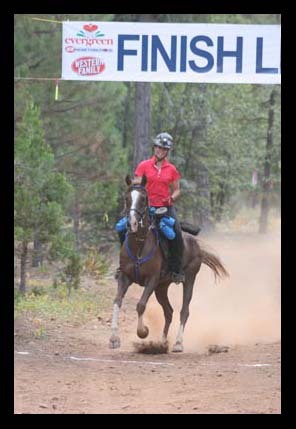 It was their next ride together, the 100 miler at the 2009 20 Mule Team, where she noticed Monk might be a little different. Team Monk just wanted Monk to have an easy ride for his first 100, and they wanted to finish with a happy horse. Monk ended up finishing 4th, and it was a successful, surprisingly easy ride for him. "I was pretty proud of him then," Lindsay said. So was Chris. That's when they really started laying the groundwork plans for the WEG, 1 1/2 years down the road. The September AERC National Championship ride - also an FEI ride - would be where Monk could try for his international COC - Certificate of Capability, 100 miles in 12 hours 20 minutes - although the course in Greenville was a tough mountainous one, and not particularly conducive to fast times; and it would be Monk's first real hill ride. Chris and Lindsay decided they wouldn't let Monk overdo it - if it didn't look like he'd easily make his COC time, they'd just try to finish the ride, and go for their COC at the next 100-mile ride, over a flatter, easier course in the desert. What Monk did blew them away. He won the ride - and won easily (in 9 hours, 58 minutes), well within COC time. And he got Best Condition. Lindsay was overwhelmed by his performance. "It was a spectacular ride. I knew he was good, above average, but the AERC National Championship was a cakewalk for him - seeing how easy it was, he was so far ahead without trying, and he always wanted to go faster." 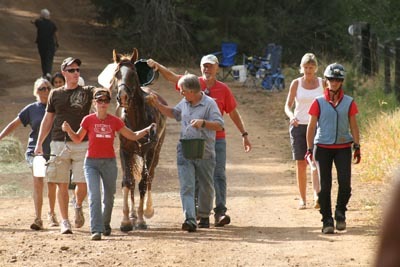 Since then, Monk's program has consisted of 2 more well-planned rides (a 50 miler - 3rd place and Best Condition in November, and a a 100 miler - 2nd place and Best Condition in January 2010) and strategic training designed to increase his fitness, and slowly bring him along to be ready for the first Selection Trials in Oregon in June, then the final selection in Illinois in August, then hopefully Kentucky in September. Chris's training of Monk consists of some riding, lots of ponying off an ATV (sometimes with side reins), lots of rest, and a killer hill, that Monk loves to gallop up. "His heartrate gets up to 200 at times, but he recovers quickly and he always asks to keep going." Monk is a lean horse that is hard to put weight on (and sometimes he's a finicky eater - hence the name 'Monk'), and Chris weighs him every day, and bases his training schedule on Monk's weight and resting heartrate. He must be doing something right, because Chris says it's hard to stress Monk. "I've never ever seen him tired, never ever seen that dull look in his eyes. He's always bright, always has his ears forward. He's been out of breath yes, but tired or reluctant to go - never ever. And we've never let him go in a race, so we don't know how fast he really is." It's been quite tempting to let him go... but Chris and Lindsay are erring on the side of conservative, always keeping their eyes on the ultimate goal of the WEG in Kentucky. Chris credits Monk's barefoot program with a lot of his success. He puts on gloves for Monk's training and glue-on boots for the rides. "Monk would never be able to do the hard training he does without the boots that soak up the concussion and protect his soles. They play an integral part in keeping him sound." The June West Selection Trails were a great success for Monk. They'd trained as best they could but the weather didn't always cooperate, so Lindsay wasn't sure how fit Monk would be. "We certainly hadn't cantered 80 miles before - but he handled the trial so well, and now I know he could have easily done another 20 miles. He stayed with Smitty (Sir Smith, ridden by Jeremy Reynolds) - a hellion, a freight train, who does not tire - they went stride for stride, went very well together." Lindsay credits Monk's success to his natural ability, and his mind. "He's athletic, fast, and has a great mind. That sets him apart: his mind. Sometimes you have a really good mind but the horse is slower or doesn't have that great drive. Or sometimes you have the drive and the speed but the horse is crazy. Monk is the best of both worlds." Chris adds: "He's laid back, and easy to handle. He's not a hot horse; he's easy to rate, always wants to go, but he's not stupid about it." If you watch Monk at a ride, you'll see what they mean about his mind. When Lindsay gets on him, he's all business, ears pricked and ready to get on the trail. Arriving at the vet checks, his heartrate drops like a rock, and he just follows behind his groom, head down, ears to side, looking almost - bored. Certainly not stressed. And definitely not worn out. "At first when he'd do that, I thought - is he tired? Is it too much for him?" Lindsay said. "But as soon as I'd get on him, he was always ready to go again." How experienced does an endurance rider need to be to make the Team for the World Endurance Championship? Lindsay knows she she's limited on international competition, but she knows about team riding from her UC Davis equestrian team participation, and she does know the endurance horses she has ridden - Phoenix Affair and Monk - intimately. "I'm a good rider; an excellent horsewoman; I have good intuition; I'm serious and I stay focused; and I care about Monk. A lot. For me, it's safety first, for both of us. I think it's possible to ride fast and smart at the same time. No matter where I finish, if the horse looks good at the end of a ride, I know I've done well, and I feel good at the end of the day. "And it's time for new blood on the US Team! But no matter what, through it all, it's been tons of fun." Chris echoes the confidence that Lindsay has. "I have every confidence that we will make it to the final selection, where we will see if Monk is as good as we think he is. We just want a fair shot; and let the cards fall where they may. We want a good team for the US, and we're hoping we're on it. Proof is in the pudding and if he is not chosen we will go home with our heads held high, and we'll be rooting for the US team." Maybe it's not so crazy Chris and Team Monk are so obsessed with their horse, and maybe the WEG is an unobtainable goal. "He's a gift - he's a once in a lifetime horse."